Ancient Jewish letter writing is a neglected topic of research. Lutz Doering’s new monograph seeks to redress this situation. 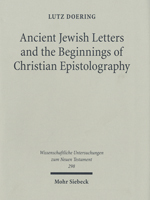 The author pursues two major tasks: first, to provide a comprehensive discussion of Jewish letter writing in the Persian, Hellenistic, and Roman periods and, second, to assess the importance of ancient Jewish letter writing for the emergence and early development of Christian epistolography. Although individual groups of Jewish letters have been studied before, the present monograph is the first one to look at Jewish letters comprehensively across the languages in which they were written and/or handed down (chiefly Aramaic, Hebrew, and Greek). It operates with a broad concept of "letter” and deals with documentary as well as literary and embedded letters. The author highlights cross-linguistic developments, such as the influence of the Greek epistolary form on Aramaic and Hebrew letters or the non-idiomatic retention of Semitic "peace” greetings in some letters translated into Greek, which allowed for these greetings to be charged with new meaning. Doering argues that such processes were also important for early Christian epistolography. Thus, Paul engaged creatively with Jewish epistolary formulae. Frequent address of communities rather than individuals and the quasi-official setting of many Jewish letters would have provided relevant models when Paul developed his own epistolary praxis. In addition, the author shows that the concept of communication with the "Diaspora”, in both halakhic-administrative and prophetic-apocalyptic Jewish letters, is adapted by a number of early Christian letters, such as 1 Peter, James, Acts 15:23-29, and 1 Clement . Ancient Jewish and early Christian letters also share a concern with group identity and cohesion that is often supported by salvation-historical motifs. In sum, Lutz Doering addresses the previously under-researched text-pragmatic similarities between Jewish and Christian letters.